What to buy in Riga and Jurmala? - Shopping better to start with authentic stuff. More information about the national Latvian goods and souvenirs which will be pleasant memories about the trip to Latvia read on this page. We have to add to this info that the excellent gifts from Latvia which you can buy in Riga and Jurmala can be a large box of chocolates with various liquors "PROZIT"), manufactured manually 70 kinds of the soap boiling balls and cosmetics for the bath "STENDERS", christmas cookies "Pepper cookie" and various kinds of cheese (including with caraway seeds, smoked, home, etc.) and fish, which you can buy at the Central market of Riga. In Jurmala all shops, restaraunts, leisure activities, souvenir shops and cosy street cafes are concentrated on the street Jomas street (Jomas iela) in Majori. At the entrance to Jurmala city there is also Shopping center "Lielupe". Mail office and various shops are collected in Dubulti, and across the rest of Jurmala there are numerous food shops and grocery shops (the prices for the products here), restaurants and cafes with fresh pastry fancy cakes prepared right on the spot. If you are going on vacation in Jurmala, then all that is necessary for leisure you can buy in our resort city shops, but for the good shopping it's better to go to Riga which is located only 20 km from Jurmala. Shopping in Riga will not require long flights and large costs. Modern shopping cetres, relaxed european atmosphere, a huge choice of various goods, service in the English language makes shopping in Riga attractive activity and allows you to get a lot of pleasure and positive emotions. An important plus shopping in Riga - it can be done with any amount of money because prices in Riga shops are different - from cheap to expensive. 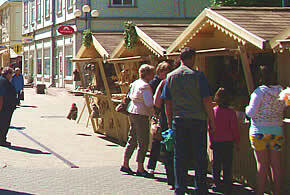 Shopping in Riga has seasons of sales and discounts. Even with a small amount of money, you will come back home with full hands. On the sales you can buy different clothes "middle class", and the stylish fashion collections and prices will be significantly better. 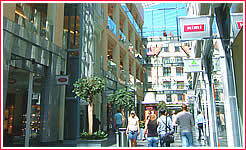 Shopping in Riga is convenient because stores and shopping centers are concentrated on a compact territory. District between streets Brivibas, Terbatas, Kr. Barona, Caka (on the map is marked in blue) is the main shopping centre of Latvia, which is flooded with a large number of shops of the world brands of clothes and shoes for men and women of all generations. Slowly walking on this streets in the center of the city, crossing the street and alternately looking at shopping centers, boutiques and confectionery candy shops and pastry is the best choice for shopping trips. In the Old Town (on the map marked in red) there are exclusive shops of "haute couture" located. In Riga large shopping centres and malls combine numerous boutiques in the shopping malls and offer products of various classes - from the children's and youth fashion to exclusive things from the latest collections of all European fashion houses. For fans of shopping in big shopping centers we have prepared the map of Riga with marked on it shopping centres and mall: (red - the most significant shopping centres and malls of Riga, violet - large shopping centers, yellow - small shopping centres, but where you can buy everything you need, blue and green hypermarkets MAXIMA and RIMI, respectively). Go to sites shopping centers and see what boutiques and shops are represented here and what actions discount sales and outlets. About 60% of all Riga's families spend their week-ends in shopping centers and malls. And this is not surprise, because shopping centres in Riga became from locations for shopping of modern fashion centers to modern leisure parks in Riga Latvia open all days in a week including sunday. There you can find plenty of boutiques and fashion stores, shops of cosmetics and perfumery products, food shops, fantastic children's activities parks, bowling, skating rinks, carts, video games, movie theatres and places of public catering, restaurants, pizzerias, cafeterias. Shopping centers in Riga - opening hours 10:00-22:00. What to buy in Riga? - the question, falling off at once, you should be on the narrow small shop streets of Riga or in huge riga shopping centers and malls. A modern five-storey shopping centre "Gallery Center" is located in the heart of Old Riga and includes shopping street that was built as a glass arcade with shops, cafes and restaurants. In the shopping centre there are located 130 stores and boutiques such as Tommy Hilfiger Denim, Marc O'Polo, Gant, Gabor, Diesel, G-Star Raw, Cardin, Promod, Tuzzi, Apriori, Gerry Weber, Betty Barclay, Timberland, Dressman, Baltman, Cubus and many others, and on the fifth floor - center of beauty, health and sports Kolonna SPA. In the "Gallery Center" you can do shopping and spend your free time. 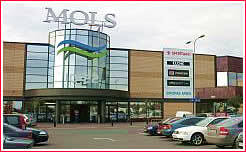 The first shopping mall of Riga is "Mols" and it's still one of the main shopping centres in Riga, attracting a lot of people on cars. At present it is located 130 shops, here you can find clothes of such well-known brands, as Vero Moda, Camel, Esprit, MEXX, Olsen, Reserved, Chester, Daniya, Bata, Stepper, Zapping Milano, Lee Cooper, Bik Bok and many others. Next to the shopping centre MOLS on the Krasta street - located the center of rest and entertainment LIDO and shopping centre of exclusive design and of fancy foods MC² (MC Square). Shopping centre "Spice" in Riga where collected 120 shops, "BOWLERO" (leisure centre and bowling), the children's town of LIDO, where you can ride children's train, learn to drive a car in the children's driving school, climb and jump under the supervision of attentive baby-sitters, as well as the largest hypermarket RIMI with his bakery and pastry-shop, a cafe and a bar, offering fresh juices. 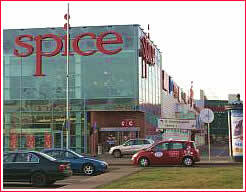 Next to the main building of the shopping centre there is a great shopping centre of furniture and design "SPICE HOME" collecting together under one roof 40 shops of furniture, objects of an interior, design, decorations and goods for the house, that will add to your housing bright, unique and individual look. The new modern shopping shopping center of the fashion and entertainment in Latvia, it is possible to find a large number of shops of fashionable clothes and footwear MOTIVI, BERSHKA, MOSKITO, LA CHIC, GUESS, Baby City, ECCO, SALAMANDER, etc., shop perfumery DOUGLAS, as well as the grocery store Prisma and fantasy Park, where you can play bowling or video games and have lunch and dinner. As everywhere there is a large free parking for cars. It is the largest shopping centre of clothes and footwear, offering mainly fashion goods and stylish household items, the main focus of which is made on clothing and footwear both known and new for the Latvian market of brands. What to buy in Latvia?! The exclusive creation of Latvian designers can also be bought here. 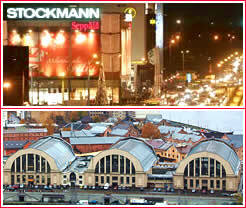 Shopping centre "Domina" is located not far from the centre of Riga, next to the bridge Zemitanu. There is free parking and entertainment for the family leisure holidays and the game in bowling. A huge shopping shopping centre "Alfa" with lots of shops of clothes, accessories and goods for the house, which includes a hypermarket RIMI and cinema "CINAMON" with several halls, popcorn and night sessions. Here you can come with the whole family not only for shopping - everyone will find activity for itself and the main thing - here is very good transport connections. Consultants in the info center GALACTICO will help where and what to buy in riga and in this shopping centre. Opened in October 2010, in the center of Riga the new shopping 7-storey shopping centre "Riga Gallery", where 220 shops and boutiques are grouped in the same category of goods. This shopping centre offers visitors a new era in the sphere of shopping and entertainment with unlimited possibilities to have a leisure rest from the routine of everyday life and do the shopping in the atmosphere of elegancy and superior style. In winter time on the roof of this shopping center you will find ice-skating playground with fantastic view on Riga. Opened in 2006 the shopping center "Azur" offers for visitors more than 60 standard shops of clothes, footwear, the goods for homes (housewares) , the most famous of which are Dressmann, Danija, KristiAna, New Yorker, Lindex, Drogas, Seppala, Salamander, Berghoff. Also there is a huge hypermarket RIMI, which as well as all other malls and hypermarkets in Riga offers a huge selection of food and local cuisine, clothes, footwear, goods for everyday life. Large shopping "PODIUM" on four floors offers to buy only an exclusive men's and women's clothing and footwear only the world's leading brand manufacturers of clothing, handbags, shoes, accessories, interior items, home textiles, such as Baldinini, Pal Zileri, Ferre, Richmond, Furla, Moschino etc. It's easy to get lost in store while shopping and doing many unplanned purchases. Most importantly, do not forget to visit cafe where you can drink a cup of coffee from the most expensive in Latvia the coffee machine. 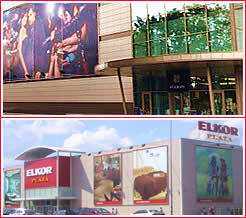 Huge shopping centre "Elkor" presents a wide choice of products of the leading world manufacturers: electronics, home appliances, sports equipment, clothes, bags, perfumery, goods for children, stationery, books, home textile, tableware, lighting fixtures, sanitary equipment, finishing materials, musical instruments, furniture. On spacious area of the shopping mall "Olympia" you can find everything you need: a bank, dry-cleaner's, hairdresser's, video shop, solarium and 70 other shops, 7 restaurants of a fast service, barber for dogs and ice rink under the roof. Also there is a hypermarket RIMI, which as well as all other hypermarkets in Riga besides a huge selection of food, clothes, footwear, goods for the house offers to buy products for self-cooking, bakery and candy-shop, fancy and cafe with freshly squeezed juices. Convenient small shopping centre "Sky" on the road to riga zoo. There are grocery store Sky with one of the best gastronomy and delicatessen shop in the city, a few restaurants and shops of fashionable clothes, as well as a beauty salon and shop where you can buy environmentally friendly products. 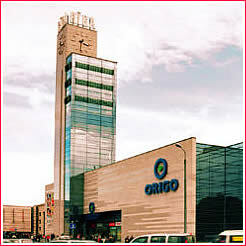 Small friendly prices in the shopping centre Origo, loved by youth and students. This shopping mall combines old traditions and new trends and located on the Central Station Square, which has always been one of the most active and important places in the city. Near stops of public transport, there is also paid underground parking. In the quarter between the streets of Elizabetes, Dzirnavu, Marijas (Caka) and Kr. Barona is located stylish passage "Berga Bazaar", the historical pedestrian centre, reminiscent of a small medieval town, built in the 1880s. Little boutiques, popular simple and fashionable restaurants and cafes, many fine benches will make you forget that you are in the active city centre. Here You will find everything what heart desires: handmade chocolates, stylish clothes and fur, modern and historical maps, great soap, Latvian linen, delicious pastries, French wines and dishes. Located in the very center of Riga shop mall "Stockmann" offers the wide range of fashion items of such world known brands such as Hugo Boss, Moschino, D&G, K.Lagerfeld and etc. This shop offers the services of a personal stylist and tailor for tailoring. In the food department of the shopping center you can buy the high-quality food at especially attractive prices. Also here is a multiplex cinema "Forum Cinemas"
The central market of Riga - the largest indoor market in the whole of Europe! Rich colours, a variety of smells, unforgettable atmosphere of Old Riga's goods on the shelves of all produced and grown in Latvian - all this makes the Central market of obligatory place of visiting tourists. Latgale market (Sadovnikova iela 9a) - this is our "flea market" or the radio-market in Riga. Here you can buy CD, DVD, mp3, movies, music, software, computer toys - counterfeiting, the most part pirate discs, as well as various spare parts, tools, equipment, books and etc. For shopping tours in Riga you can select several directions. You can start with the "inspection" retail shopping centers, and if you like walking along the streets of Riga, you can go into the street Terbatas (map of the district street Brivibas, Terbatas, Kr. Barona and Caka is marked in blue) and looking goods in shops where you like names and show-windows. There are collected outlets, stock and small discount shops of the substantial european brands George, NewLOOK, Next, D&G, GF, Fendi, Byblos, BLOW, Motivi, Esprit, Mango, Benetton, Kenzo, Escada, Jil Sanders, Laurel, Levi Strauss and etc, great fashion stores such as Palazzo Italia, SKALA, MILANO čnd many others (the list of ą1, ą2, ą3). Also you will find here shops of perfumery and cosmetics KOLONNA, Boheme, Drogas, Dzintars, latvian-produced women's underwear Lauma, ROSME, VAIDE, MAGNOLICA, the shoe stores Ecco, Gabor, Rieker, and etc, outlet BestSecond, CITY Fashion, brands are sold for ridiculous money, shop-restaurant sea food Gastronome. And after a successful shopping, you can look in one of the many confectionery and coffee houses, such as Mārtiņa beķereja, Dēli, Sala, Vecrīga, "Double Coffee", chocolate cafe Emils Gustavs or restaurants, among them are the LIDO on Dzirnavu street and on óë.Elizabetes.